Being follicly challenged (at least on my scalp), I think hair is overrated. 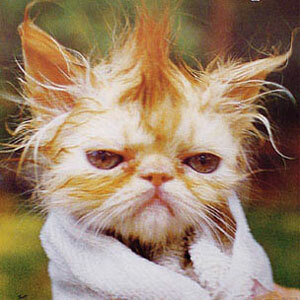 Thus I have a limited amount of sympathy when I hear complaints about bad hair days. I like to think I’m not vain. And in that vein (no pun intended), I’m no fashion hound and am usually not critical of the appearance of others. That being said, I really don’t particularly like looking like a fool. Likewise, I do notice when others look like fools. I assume they must not know how they look, because I assume they don’t like appearing foolish any more than I do. And, when I do look foolish, I appreciate being told. So there I was, in a very modern hospital, with a loved one who was there for a very modern (indeed, miraculous) procedure – a full joint replacement. Everything just shrieked ultra current. This hospital (rightfully) wins awards for the cutting-edge (sorry – I couldn’t resist) quality of its joint replacement work. And then we went to check in. The patient dutifully gave the extremely solicitous admissions clerk the usual information, which the clerk dutifully checked against the hospital’s computer records and/or entered into the system. OK; standard fare. The clerk printed out a handful of documents filled with legal-, medical- and techno-babble and handed them to the patient to sign. The patient signed the papers and returned them. The clerk scanned every paper back into the system. Now, I and many others have written and spoken at length about the waste and inefficiency of such a system. But at least, I assumed, the reasoning was based on some perceived need to retain a hard copy of a wet-ink “original.” Indeed, the efforts have largely focused on either helping people realize the rules really don’t require wet-ink signatures or, where it’s still unclear, modernizing the rules. But to send the papers directly to the shredder – oh, my! Despite all their good work (and they DO do good work); despite the outstanding quality of their product and outcomes, this up-front, customer-facing process makes them look foolish. My further point: Doctors and judges MUST foster trust and confidence. Therefore, they in particular cannot afford to look foolish. Those of us who serve them cannot allow them to look foolish. This type of foolish is worse than a cosmetic ruffle. To a public that is coming more and more to expect modern and efficient performance all the time, it looks, well, like it’s way past its use-by date. It makes people wonder if they are safe using it. It has the potential to undermine confidence in the system. Maybe I’m being too harsh. Maybe there is some very good reason why, in the rendering of medical services, printing out documents, getting signatures, then shredding the originals makes sense. But even if it does – EVEN IF IT DOES – it still LOOKS terrible. I sincerely hope courts are not allowing the same appearance; although I strongly suspect there are still some that do. Again, I can only assume that the judges in those courts are unaware of how it makes them look. Just as most people appreciate being told if an inopportune button is loose or zipper unzipped without their knowledge, I’d assume judges would like to know if they are unintentionally and unknowingly being made to look foolish. It would be a kindness to point out the advantages of eSignature in this regard. Keeping a hard copy went out of fashion several years ago; time to update the look.